"stainless steel takes about 1/3 less amperage than carbon steel !" Before we get too deep into welding stainless steel, if you read my web page on Welding Steel , you may remember that plain carbon steel is basically Iron and Carbon with small amounts of other stuff like manganese. Low Carbon Steel has .3 percent carbon. Not 3 percent but 0.3 percent or point 3 percent. That’s not much. For comparison sake, Cast iron has a full 3 percent and sometimes more. That’s why cast iron is such a pain to weld and also why low carbon steel is the easiest metal to weld… low carbon steel is also the cheapest metal to buy. Low Carbon Steel is what we use to learn to weld and low Carbon steel is what we compare all other metals to when we study metals. Why? Well it’s easier to understand stuff if we can compare it to something we already know and understand. Well now its time to compare something else to carbon steel. Let’s compare stainless steel. Stainless steel comes in several different varieties. Most welding “noobs” are not aware of this fact. The stainless properties of stainless steels are primarily due to the presence of chromium in quantities greater than roughly 12 weight percent. stainless steels contain some combination of iron, chromium, and nickel as the main elements. Most stainless steels are mostly iron. If your are familiar with the term 18-8 stainless that was widely used in the advertisement of stainless steel cookware, the 18-8 signifies 18 percent chromium and 8 percent nickel with the remainder iron. One thing I have to mention about welding stainless steel is that the back side of the weld needs argon shielding just as much as the front. The photo of the aircraft engine stator being prepared for welding displays special tooling made for the purpose of shielding the back side of the weld. If the penetration side is not shielded with argon, it will "sugar" which is a slang word for oxidize. Granulation is another descriptive term that accurately describes what happens. 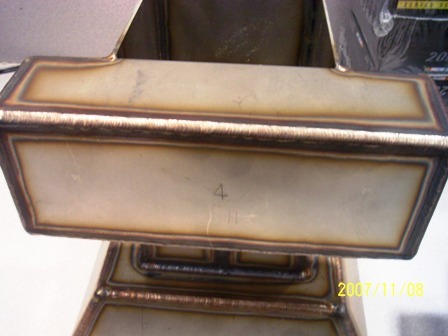 A closeup photo of the granulated or sugared stainless steel weld reveals why sugared welds fail in service. There are deep pits and crevices that are bound to develop into cracks.